Hope gives encouragement. The last six months in our country was a time of learning about the election process, voting for candidates, waiting for results, and ultimately hoping for a new elected government to rule the country and take concrete steps to bring prosperity and integrity to Afghanistan. We are just like other citizens in the world. We want peace, development, prosperity, and unity and we are hoping for a new era in our country. Both candidates’ parties have interesting mottos. One is “evolution and continuation”—this is President-elect Ashraf Ghani’s slogan. Abdullah Abdullah pledges “reform and convergence.” Now that both parties are trying to work together, the majority of us are hoping there will be no more ethnic and tribal differences and justice will be provided to the Taliban supported Mr. Ghani’s party, but not the opposition party. If the government formed is honest and united, it can easily be at peace with the Taliban and shape a peaceful, united Afghanistan. The philosophy behind the national unity government is not only bringing together the two parties, but the Taliban can also be covered under the definition. So in principle the new government should call upon them asking for peace and their participation in government. Not everyone in Afghanistan is happy about the united government. Some members of both parties have reservations. Mr. Ghani’s supporters opposed it. They said that he and his party won the vote count and deserve to be president and form their government. 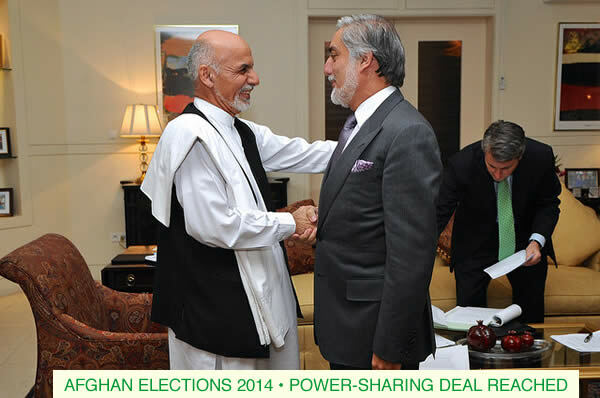 Abdullah’s supporters said that their candidate was the true vote winner, had the votes been properly counted. There are mixed feelings, but the important thing is that the majority is happy. People have finally been able to get back to work. They had been afraid to continue investing in their businesses and were hoarding cash in case they had to flee the country if the situation got worse. But now they are investing again and there is a hustle and bustle back in the city.